6 weeks old: What did I do before without a video monitor? My daughter is almost 6 weeks old, and since we brought her home from the hospital, we have been using, enjoying, and relying on the Slim&Secure Handheld color video monitor by Summer Infant. What did we do without this with our other two children?! I am fully convinced now that all parents should have a video monitor! With my first two children, we had a basic audio monitor and thought it was fine. I thought, at the time, that a video monitor was a frivolous purchase and not necessary. But after using the Slim&Secure video monitor, I have changed my tune. There are a number of reasons why. We have been having my daughter sleep in her crib in her room from day one. With my other two children, I kept them in the bassinet, partly for convenience, but also because I wanted to be able to see them. This time, though, because of this video monitor, I have the confidence and peace of mind to leave her in her room. I can see and hear exactly what is happening with a crystal clear picture (in color, no less!) and crisp sound. Even in the dark at night, the picture changes to night view in black and white and is super clear and very easy to see. I never have to sneak into my daughters room to check in on her, I can just look at my monitor! (And I can see a much better picture on the monitor in the dark than I can if I were to sneak in the room!) Also, unlike my audio monitor, I have yet to have any interruption or cross-signal with my cordless phone or other electronic devices. All of these features add up to a great video monitor that allows me to feel confident that my daughter is safe and happy in her crib. 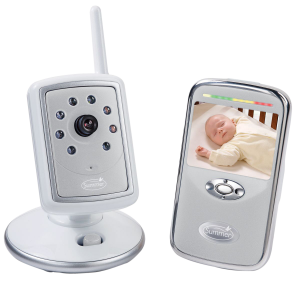 Check out the Slim&Secure color video monitor by Summer Infant as well as some of the other video monitors and great products that they offer for babies and kids. « Are You A Mom Blogger? Are You Coming to #StyleSchool in NYC on August 20th?